Cycle Southwest Wisconsin - Southwest Wisconsin FREE Bicycling Map - Some of the best bicycling anywhere. We are very pleased to introduce our new Cycle Southwest Wisconsin blog! To kick off our blog, we are excited to have Mike Magnuson travel to Wisconsin from California to cycle his way around our routes and write about his experiences along the way. Mike Magnuson was born and raised in Menomonee Falls, Wisconsin. In his twenties, he lived in Eau Claire, Wisconsin, and has since then lived in Ohio and Minnesota and Florida and Illinois. 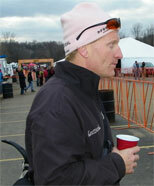 He has been a contributing writer at Bicycling magazine since 2004. His articles and short stories have appeared in Backpacker, Gentleman’s Quarterly, Esquire, Men’s Health, and in a number of literary journals. He is author of two books of nonfiction: Heft on Wheels: A Field Guide to Doing a 180 and Lummox: The Evolution of a Man. He has also published a couple of novels: The Right Man for the Job and The Fire Gospels. These days, he lives in the Los Angeles area and is writing scripts. He loves to ride bicycles and really loves racing cyclocross. We hope you enjoy reading about Mike’s adventures. We think you’ll want to experience it for yourself and so we invite you to hop on your bike and go for a ride. Cycle Southwest Wisconsin welcomes you. Sign up for our FREE Cycle Southwest Wisconsin email newsletter! !